(Ed. As Jean and Dusty were unable to attend this walk and BBQ, my report follows below). THE WALK. After a somewhat inclement week, it was a relief that it was sunny and warm on the morning of this annual, much anticipated walk at Sullington Warren. As always, this walk was followed by a barbeque at Jill and Brian’s super home, The Barn. 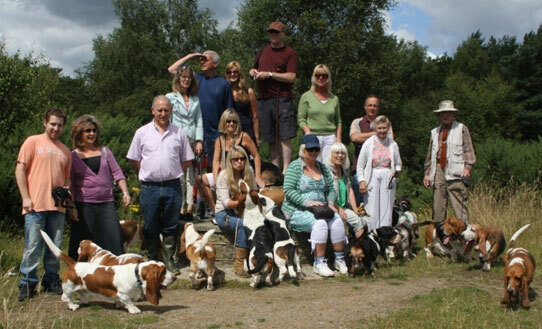 Twenty one hounds and their owners gathered at the car park eager to spend a few pleasant hours in each others company. There seemed quite a high ratio of males in the pack and even though there were a few friendly mock battles along the way all the hounds were exemplary in their behaviour. After an initial climb, the track took us down through the cooler woodland. Scents and the sight of strangers and rogue dogs led some of the pack to break away; a few calls brought the offenders back. We looped around and climbed out of the wood and up to a stone vantage point - an ideal spot for a group photograph (see above). The views from here across the Downs are spectacular, though as you see, Chris seems more intent on keeping an eye on his van in the car park. From here it was open Downland and the hounds enjoyed playing and chasing each other around. It was very warm and Sue - the hounds’ Mother Teresa - gave water to the thirsty. It was a joy to watch. After this welcome breather, we headed back into woodland and headed towards the car park. However, once in the woods there was another Basset Hound breakaway. 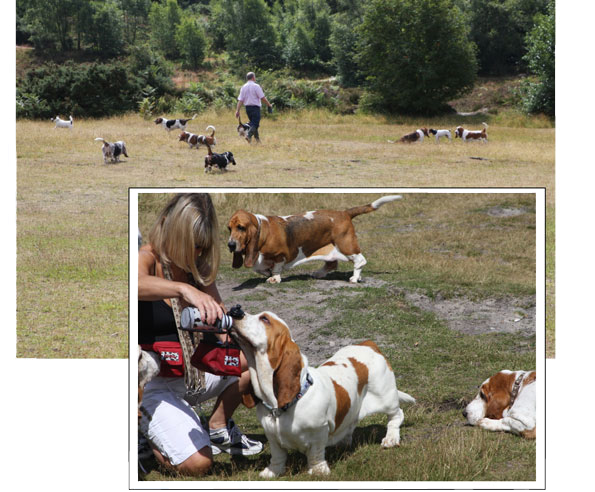 Or rather, Bassett family breakaway; as Jonathan led his parents and hounds on an alternative route back to the cars. No problem, as we were all reunited again after a few minutes. THE BARBEQUE. 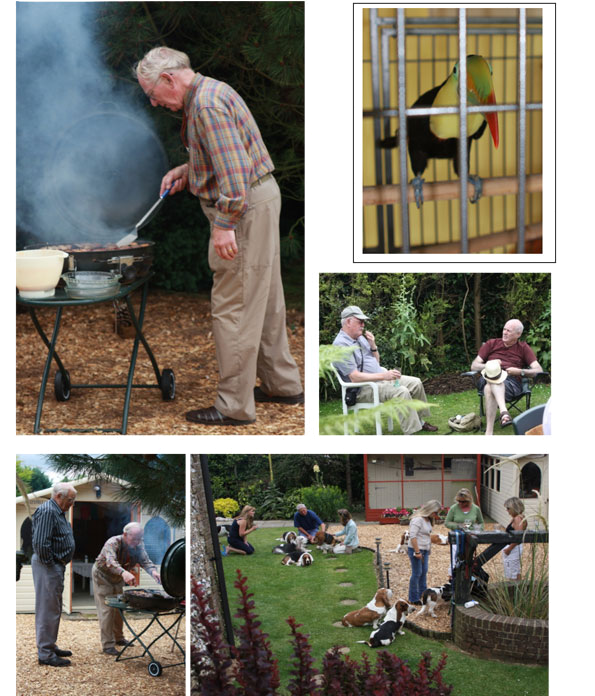 Walkers and hounds travelled in convoy from the car park venue to The Barn and arrived in eager anticipation of good food, a tincture of liquid refreshment and some fascinating conversation - we were not disappointed - Rainbow the Toucan held court and was most enthralling. Brian, the sophisticated version of Gordon Ramsey - I’m sure that he only curses in Latin - fired up two barbeques, such is his mastery of the culinary arts. As the rest of us sat around with our drinks chatting, his occasional wraith-like form could be seen in the swirling smoke. In no time at all he emerged bearing platters of wonderful of grilled meats. The gathering quickly descended upon these and together with fine salads and other dishes enjoyed an al fresco banquet. Wonderful! Everyone there enjoyed this marvellous day.